Flew from Binghamton to Detroit aboard Northwest Airlines, and then from Detroit to Las Vegas, arriving in the early afternoon on June 2nd. Our rental car on this trip was a really cool PT Cruiser - ivory colored! We stayed at the 'Paris', making it the second casino/hotel at the corner of 'The Strip' and Flamingo Road for us to stay at. Jill spoke at the HCCA conference which took place at the Aladin Casino, next door to the Paris. We had a chance to eat at the Mesa Grill in Caesar's Palace on Thursday nights, as well as Mon Ami Gabi in Paris on Friday. We had dinner at Susanne and John's house with Aunt Norma and Uncle Harold, Suzanne, John, and their kids. We attended the Dessert Expo which was held at the Las Vegas Convention Center and had some yummy desserts. We actually created our own company, 'Tim and Jill's Creations', to attend the expo and walk around - to funny! We went to Fremont Street one night and saw the car racing show on the ceiling, as well as doing some gambling, eating the 99 cent shrimps at the Golden Gate (and listening to the piano player for a bit), and drinking a mudslide out of a football, which pretty much did us in for the night! 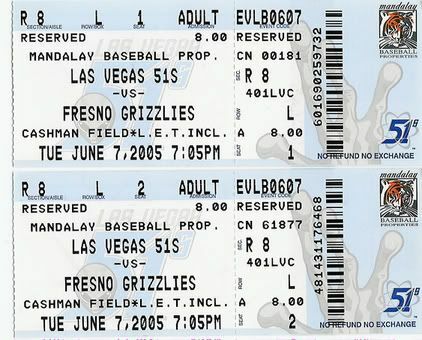 June 8, 2005 - Justin Knoedler's three-run homer capped a five-run ninth inning as the Grizzlies rallied for a 10-8 triumph over the Las Vegas 51s on Tuesday night. Fresno trailed, 6-5, heading to the ninth, but Brian Dallimore tied it with a one-out solo homer off closer Aquilino Lopez (3-4). Todd Linden doubled and Doug Clark was intentionally walked with one out before Jed Hansen doubled in the go-ahead run. Knoedler followed with his fourth homer to make it 10-6. Las Vegas made things interesting in the bottom of the inning on Dioner Navarro's two-run homer. But Jack Taschner regrouped and retired the next three hitters to preserve the win for Brandon Puffer (5-2), who gave up a run in the eighth. Clark was 4-for-4 with two doubles, a walk and tied a team record with five runs scored. He was 8-for-10 in the series with hits in each of his final seven at-bats. Neither starter lasted four innings. Fresno's Brian Cooper gave up four runs on seven hits and four walks in 3 2/3 frames, while Las Vegas counterpart Elmer Dessens surrendered two runs on three hits in three innings. Cody Ross hit two of the 51s' four solo homers, with Joe Thurston and Henri Stanley accounting for the other two. Las Vegas has lost three straight and four of its last five games.